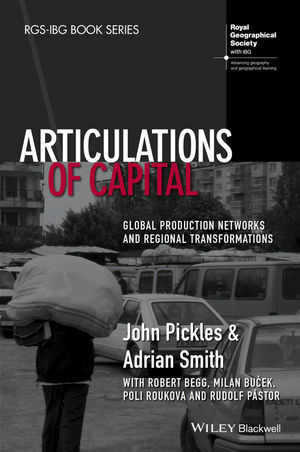 Articulations of Capital offers an accessible, grounded, yet theoretically-sophisticated account of the geographies of global production networks, value chains, and regional development in post-socialist Eastern and Central Europe. John Pickles is Earl N. Phillips Distinguished Professor of International Studies in the Department of Geography at the University of North Carolina, Chapel Hill. His publications include A History of Spaces: Cartographic Reason, Mapping, and the Geo-Coded World (2004), Globalization and Regionalization in Post-socialist Economies: the Common Economic Spaces of Europe (edited, 2009), and Towards Better Work: Understanding Labour in Apparel Global Value Chains (co-edited with A. Rossi and A Luinstra, 2014). Adrian Smith is Professor of Human Geography and Dean for Research in the Faculty of Humanities and Social Sciences at Queen Mary University of London. Editor-in-Chief of the journal European Urban and Regional Studies, Dr. Smith has authored and co-edited five books on post-socialist Europe, including Domesticating Neo-Liberalism: Spaces of Economic Practice and Social Reproduction in Post-Socialist Cities (with A. Stenning, A. Rochovská, and D. Świątek, Wiley, 2010). Robert Begg is Professor Emeritus of Geography and Regional Planning at Indiana University of Pennsylvania. Milan Buček is Professor and Head of the Department Public Administration and Regional Developmente at the University of Economics in Bratislava. Poli Roukova is a Senior Research Fellow in Economic and Social Geography at the Bulgarian Academy of Sciences. Rudolf Pástor is Assistant Professor of Geography in the Department Public Administration and Regional Developmente at the University of Economics in Bratislava.